Review: American Express - Purchase Protection Plan! American Express Purchase Protection is another reason why everyone should have an American Express credit card! All American Express cards come with Purchase Protection! What this means: If you buy an item on your Amex card, and it breaks or gets stolen within the first 90 days after purchase, don't worry! American Express will give you back the money you spent on the item! Click here for more info, or here for full benefit details. If item was stolen: Amex will refund you the money. If the item is really large and heavy and would be expensive to ship to Amex, they may ask you instead, to mail them a picture of the damaged item, as proof of damage. Once you have filed a claim, click here to check the status. Note: For Amex Platinum Cardholders, Amex will cover up to $10,000.00 per occurrence. They will also cover lost items. Priceline is a site famously known for their Name Your Own Price for flights, hotels and cars. You choose a price, put in your credit card details and they will tell you if your price has been accepted and by which hotel/airline etc. If you play it right you can get some unheard of prices. They also have a regular section where they tell you the price (like Expedia, Orbitz and Travelocity). This review is mainly for Priceline hotels. Priceline is great for car rental cars too. For flights, you have to be extremely flexible as you don't know what time the flight will be and if there will be stopovers. Priceline only lets you put in a offer once, if it gets declined, they make you change one of your options (E.g. date, area or star rating), in order to try again. They do this to force you to put in a high price in the first place, for when you run out of options to change you cannot bid again for another 24 hours. The tips and tricks listed here, are ways to be able to bid again and again. Doing that will allow you to start bidding very low, and slowly working your way up until you reach the price that Priceline will accept. Start by checking the going rate in your chosen star rating/location through travel sites, e.g. Hotwire, Expedia and Travelocity. Seeing the lowest room rates available allows you to avoid overbidding on Priceline. If you do overbid, Priceline has a guarantee that if you find a cheaper published price that is publicly available for the same night and room type, Priceline will refund the difference. So you will never be overpaying. At least not more than the ‘Regular’ rate. If you have the patience, you can check forums where people write about their Priceline experience in your destination. How much they paid, which hotel they got, what star was it etc. Two sample sites are Betterbidding.com and Biddingfortravel.com. When you are given a list of area's to choose from, if you are OK with more then one area then first bid on only one of the area's, if you're offer doesn't get accepted then include the second area in your next try. Start out bidding for high star rating hotels. If you start your bid with 2 stars, Priceline checks for 2, 3, 4 and 5 star hotels for the price you entered. If your offer gets declined, you cannot rebid by changing to a 3, 4, or 5 star hotel (even if you want to bid a higher price). But, if you start with a 4 stars, you can rebid for a 3 star. Even if you are planning on staying for a few nights, still book just one night. If your bid gets accepted, Priceline will allow you to add on additional nights at the same price. So once your bid is accepted, research the hotel online, and if you like it, then reserve more nights, and if not, reserve a different hotel for the other nights. When you place a bid, Priceline will tell you your total cost, including all taxes and fees (besides for parking and some resort fees), before you confirm payment. If the total is more than what you want to pay, go back and adjust your offer. You can always use a different Priceline account (Family, friend etc.) once you’re out of options to change... although you may have to delete your internet cookies first, or else Priceline may see it as the same person. Say you are traveling and want to stay in a hotel with at least a 3 star rating. Say there are 2 locations within your destination city: A and B . First thing you need to do is check which star levels are available in each location. Do this by clicking each area separately and taking note of which star levels are available for that area, and note all that information down. Now, you want to stay in location A in a minimum 3 star hotel. You try a low price (say $20) and it doesn’t get accepted. You then put in that you are willing to stay in area B (which doesn’t have a 3 star hotel or higher) but you still leave checked that you want to stay in a 3 star hotel and raise your price slightly. If you win, your hotel will for sure be in area A because area B doesn’t have the hotel level that you requested! If there are many locations to choose from you can really work this to your advantage. Priceline’s official policy: No cancellations, No Refunds, No changing dates. Unless there is an obvious price mistake (you entered $999 instead of $99). Many people have a phobia of dealing with sites such as Priceline and Hotwire, as they are afraid of the risks and don’t know what they will be getting. I will try to explain the risks involved with using Priceline/Hotwire. You don’t know what time the flight will be, which airline or how many stopovers. You need to be extremely flexible. You do know the neighborhood of the hotel and the star rating. The only risk involved is that you might think a 3 star should be very nice because you once stayed in a nice 2 star, but not all ratings are created equal. Priceline has its own rating system. Currently, there isn’t a universal rating system. Minimize that risk: Check which hotels Priceline lists for the star rating you want. You would do that before you click on ‘Name Your Own Price’. Read reviews on the hotels at Tripadvisor.com. Chances are that Priceline will give you the lowest priced hotel for the star rating you have chosen - so make sure you will be happy with that selection. This works well in a small place, where there are only a few hotels in each star level. True, you don’t know which car rental company you will be using till you pay, but Priceline only works with these 5 major companies: Alamo, Avis, Budget, Hertz and National. The only real difference between these companies, besides for their car selection will be: some have different insurance costs the others, and some may be off-airport (with a shuttle) while others will be right by the Terminal. How to get the cheapest car rental possible!!! Update: It seems that Priceline is starting to fix this glitch, so it might not work. It seems to work a few times back and forth, then Priceline doesn't let you continue doing it. With Car rentals there is now a glitch on Priceline. It lets you keep on changing back and forth between two locations however many times you want. So, say you want to rent a car in JFK, you start out with $8. If it gets declined, switch to LGA and bid $1, which definitely gets declined, then go back to JFK and enter $9… and so on and so forth. Bidding like this will guarantee you the lowest possible price that would get accepted! 4 star hotels for $40 a night in Chicago. Car in Orlando for $6.95 a day. $300 New York–Tallahassee flight for $80! Hot! Western Digital 500GB My Book External Hard Drive - $75.67 (After Coupon) -Free Shipping! Staples has the Western Digital 500GB My Book External Hard Drive on sale for $99.98 with free shipping! Tax will be added where applicable. Please post a comment or email me when used. Hot! Canon SD850 - $169.98 (After Coupon) -Free Shipping! Update 12:00 pm: Out of stock, might still be available in some stores. Staples has the Canon SD850 on sale for $199.98 with Free Shipping! Use a $30 off $150 coupon (You can get one on eBay for about $3.00) to lower the price to $169.98! Great little camera for an amazing price! Check out the reviews on Amazon, Dpreview, and Cnet. Bonus: Get a free Canon iP3500 Photo Printer After Rebate, when purchased with the SD850. I am not a big fan of these photo printers, which is why I put it at the end. Note: This week Staples is offering free shipping on all their products with no minimum! Update 11:25 pm: Alive again, but now its $3.24 after rebate. 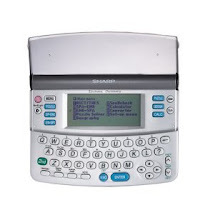 Amazon.com has the Sharp Electronic Pocket Oxford Spanish-English Dictionary/Thesaurus for $0.99 after rebate - free shipping! Make sure to buy it direct from Amazon.com, and not from a 3rd party seller! EXPIRED: Dell Vostro 1500 Notebook $399 - Free Shipping! for $399 - Free Next-Day Shipping! Amazing price for a simple laptop! Reg. price would be about $600. Note: You have to change the shipping method to Next-Day, to get free shipping. As of March 2nd, MTA will be raising fares. Read the details here. One of the changes are that they will no longer have the 20% offer: Buy a $10 card and get a $12 card. Instead they will only be have a 15% offer: Buy a $7 card and get a $8.05 card. If you commute often, consider stocking up on prepaid Metrocards. If you buy them before March 2nd, you will get the 20% offer. You will still be able to you use the Metrocards after March 2nd. Metrocards expire after one year. Even Better: Pay $1.50 per subway ride! Chase Freedom Card (one of the best non-Amex, no annual-fee, cash-back cards out there) currently has a promotion: if you spend $150 on Metrocards or Yellow Cabs between Jan. 1st and March 30th , they will give you $10! For every $150 spent you will get another $10! This is in addition to the 3% cash-back you would be getting anyway. To sign up for this promotion or to learn more click here. To apply for the Chase Freedom Card click here. Note: Chase limits your 3% earnings to $18 a month. This does not affect the $10 promotion. 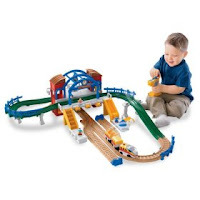 EXPIRED: Geotrax Deluxe Playset $19.97 - Free Shipping! Update 02/11: Out of stock. Costco has the Geotrax Deluxe Playset - $19.97 - free shipping! Amazing price!!! Regular price is about $40! If you are not a Costco member, there will be a 5% surcharge. Click here to see the item on Amazon and read the great reviews. 600 Tea-Bags - $25 - Free Shipping! 12 boxes of Lemon Zinger Tea, 240 Tea-Bags - $15! 6 boxes of Raspberry Gardens, Green Tea, 120 Tea-Bags - $7 ! 10 boxes of Organic Lemon Myrtle Green Tea, 100 Tea-Bags - $7! 10 boxes of Organic Black Tea, 100 Tea-Bags - $8! Add code: TEAFUN22 for $10 off. Total: As low as $19 - Free Shipping! That's as low as 600 Tea-Bags for $25 or 480 for $20! or $0.50 a box of tea! EXPIRED: Hiking Boots $3.06 - Kohls.com! Update 10:30 am: Everything is gone. Use coupon code: MVCHOME15 to get 15% off. + $0.99 shipping per item. These sales sell out quickly! Get a Compact Fluorescent 13W Light Bulb for $0.84 - free shipping. Might not be worth the time, but it sure is a cheap price for a light bulb. Review: Lifeline: A $1-Month Phone Line For Low Income Households! Lifeline offers extremely cheap phone service for low income households. If you are receiving any public assistance, e.g. Medicaid or Foodstamps, you are automatically eligible. If not, you may still be eligible, as each state has different eligibility rules. Check LifelineSupport.org for more info. New York: Verizon Lifeline - $1 a month - yes, regular landline! Note: You don't have to get the $1 a month plan. If you want more features, you can get a more expensive line for very cheap as well. Total bill after all taxes: Around $1.50 a month!!! Sign up for Verizon Lifeline: Call 800 555-5000 (or 800 483-2000). Tell them you want to sign up for Lifeline. They might make you first sign up for a regular plan and after they approve you for lifeline they will credit back your account. If you get lucky they might preapprove you over the phone, if you give them your Medicaid number, in which case you will be on lifeline from day one. It is not that bad if they put you on a regular plan first - but it's easier if they approve you straight away over the phone, and not have to wait to get credited back for the first month or two of regular prices. Either way they will ask you to fax or mail them this form. If you use this line together with Grandcentral (read here about that) then you can have a fully functional land line with caller ID, voicemail and free outgoing calls for $1.50 a month! Alternatively, this works great if only DSL is available in your area, and you need a land line to connect. You can also use it as a backup if you rely on VOIP. If you live out of NY: Check LifelineSupport.org to see what plan you can get in your area. Or call your phone company and see what their arrangement with Lifeline is. You can even get a discounted cell phone plan. EXPIRED: Pinzon Deluxe Wine Opener - $5.99! Update 12:10 pm: Out of stock. 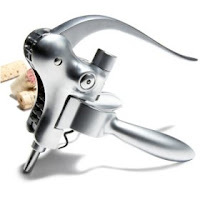 Amazon.com has this Pinzon Deluxe Wine Opener with Foil Cutter and Corkscrew for $5.99! Great price for a nice wine opener. EXPIRED: Hurry!!! SimpleTech 1.5TB External Hard Drive - $68! Update 10:15 pm: Seems to be dead. Dell.com has this 1.5 TB external hard drive for $67.99!!! Order 2 for free shipping. Must be a price mistake... Order quickly! Hot! Flights From U.S. To Europe - As Low As $220 Rountrip After All Taxes!!! Update 05/04: The $200 flights are long gone, but you can still get tickets for $200 off. Click here to follow the forum at Flyer Talk. $220 after all taxes!!! Prices differ depending on specific itinerary. These starting airports work: Philadelphia (PHL), Buffalo (BUF), Detroit (DTW), Boston, (BOS), Portland (PDX), Los Angeles (LAX), Pittsburgh (PIT) or Fort Lauderdale (FLL). You need to fly through a second airport to get to Europe. Try: ORD, IAD, PHX or LGA. Pick a city in Europe. Try: FRA, CDG, MUC, HAM, AMS, LHR or STR. Fly Monday-Friday, not on weekends. This only works on flights from United Airlines with one leg of the U.S. journey operated by US Airways or Delta. The price will be shown as higher until you chose an itinerary, then the price will drop by around $200. Probably a price mistake, so hurry! If you find different cities that work, please post a comment.